App Links are a type of mobile URLs. They make it possible to link to specific pages or screens of an app. They also allow you to link your website pages to the respective screens in your app. What do App Links do? They close the loop between the creation of content, its discovery and app downloads by creating unique links for different pages or screens of an app. Thus, App Links allow users to click links to view content directly in the app (if already downloaded), or download the app to view content present on any particular screen of the app. Is it possible to type them like URLs in the address bar? Nopes, you can only share the App Links with others. Since there is no such thing as an address bar for apps, it is not possible to type App Links in the address bar. What theory is App Links based on? 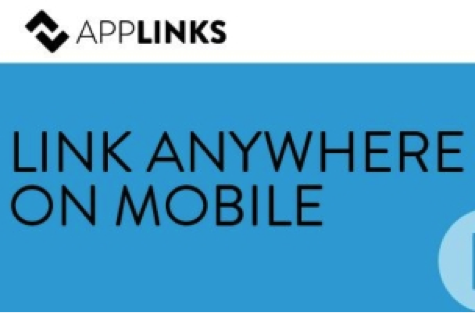 App Links is based on the principle of ‘Deep linking’, which involve linking to specific screens (pages) within apps and launching mobile apps via links. Which platforms do App Links support? App Links are cross-platform and currently support iOS, Android and Windows Phones. However, they can also be extended to support other platforms. App Links are open source, so you can use them without paying for it. You can also change them to suit any platform or environment. They let you link from an app to specific screens within the same or a different app. In short, they work like URLs for websites. If I have opened a Facebook page on my Facebook app, and if I want to share a link of that page (without visiting the Facebook website) from the app with my friend, then I will use its URL (App Link) and share it with my friend using the messages or chat window. Provided that some conditions are satisfied, you can link to a tweet in Twitter app from your Facebook app using App Links . The requirements are that both Facebook and Twitter need to have App Links enabled. Now, Facebook app has built-in App Links functionality, but Twitter has a different set of deeplinks as part of its feature called Twitter Cards. Since, not both the apps have App Links, it is not possible to link them. 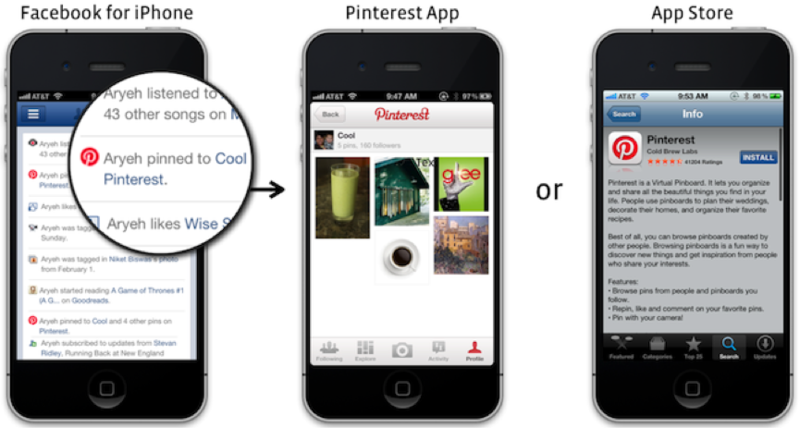 However, you can link an app like Pinterest (which supports App Links) with Facebook app. All you have to do is to go to a screen in Pinterest, copy the App Link (or URI), then open your Facebook app and paste it in your status update. Your friends who click on the link on a desktop will be shown download links for Pinteres app for platforms like iOS, Android or Windows Phone; however, they won’t being able to download the Pinterest app on their laptop. The friends who click on the link through a mobile device, will be directed to the image URL (regardless of the mobile platform) if they have the Pinterest app installed; if they don’t have the Pinterest app, they will be directed to the download link for that particular platform, clicking on which would take them to the image URL. What is the minimum requirement for App Links to work? For App Links to work, the linking and the linked apps should have App Links enabled. How to enable App Links for an app? App Links can be enabled for an app by defining customized Universal Resource Identifiers (URIs) for that app and adding specific tags in the codes of that app. 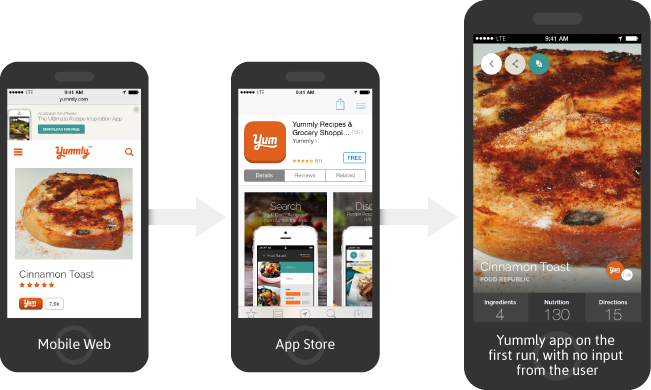 What are the different types of App links in the market? 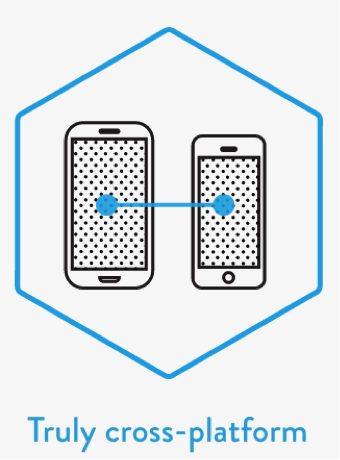 The Deeplink.me services help in making your app pages linkable through deeplinks, just like App Links. The links build using deeplink.me function for app pages of an app on all platforms. They also offer translation rules for customized URIs, user engagement analytics, link fallbacks in the case of an emergency/failure and Twitter Card (see below) support. Apart from that, deeplink.me services support retargeting in apps that help you retain customers and increase sales. It also offers features that facilitate app discovery by search engine spiders. While Deeplink.me offers a range of features with improved functionality, what sets it apart is that no SDKs are required to set up deeplinks for an app. All that need to be done is set an app up in Deeplink.me portal and the app pages get deeplinked with URIs. Deeplink.me is a paid service, since it involves extensive use of their app portal. The major companies that have implemented deeplinks offered by Cellogic Ltd are JackThreads, ThreadFlip and Shazam. Deeplinks are paid, like most other marketing-oriented services. Google indexes apps, if an app is enabled with Google App Indexing API. 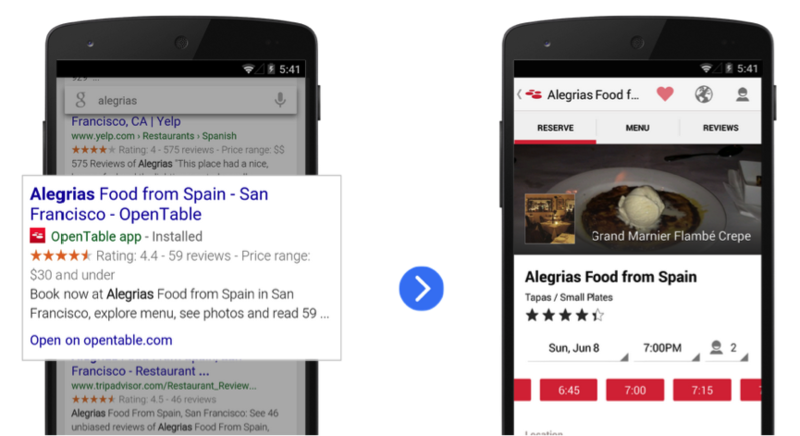 What it means is, Google can display results that include specific pages of an app, each with distinct URIs. So, users who perform searches on their smartphones get search results also from mobile apps, instead of just websites. Eg. If you search for ‘heaters’ on Google, then search results will include a list of heaters retrieved from eBay app, replete with ratings, reviews, information and the URI to the particular screen within the eBay app. 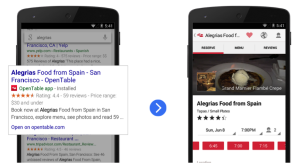 Enabling Google Search Results App Deeplinks is a three-step process. First you have to implement deeplinks in your app. Second step involves connecting your website with your app, and the third step involves verifying your website with Google. This service is only available for Android apps right now. If the user does not have the destination app installed, it takes the users to the download page for that app for that platform, then as the app is getting installed it displays a message indicating that the user will be directed to the landing page. Tapstream’s Deferred Links are mainly for app marketing companies who intend to make use of Landing Pages within their apps to generate quality leads. The Deferred Links are paid, and have different price points. One of the several different Twitter Cards, through App Cards you can tweet a link to any webpage on your website and Twitter will automatically display your tweet alongside an App Card. This App Card would show all the data regarding your app like screenshot, ratings, free or paid app, description and a link to its App Store depending on the mobile platform you prefer. For this to work, you should have the App Card enabled in your website and have specified your card type and app IDs for iOS and Android. This App Card can also show links to specific pages within the app for the website, provided the app has deeplinking enabled. 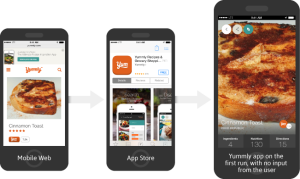 URX has developed two separate approaches for deeplinking within apps. 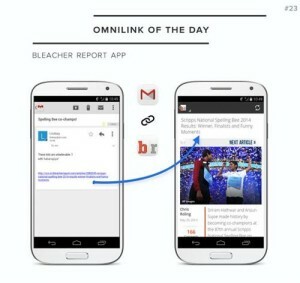 Omnilinks helps users to link to specifc pages within the same or a different app. This approach is especially useful if a user doesn’t have an app installed, in which case the user is directed to the download link for the app on the platform-specific app store. And, if the user already has an app installed, he is directly taken to the specific screen within the app. This facility is extremely useful to marketers who intend to increase their app downloads by directing people towards it through social media and other marketing channels. 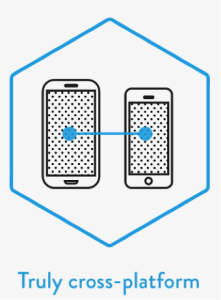 The Omnilinks.js approach is only for deeplinking within apps that users have already downloaded. So, this approach doesn’t work for the apps that a user hasn’t downloaded. Omnilinks.js can be used for in-house staff usage for easy transitions from website to mobile app and vice versa. To create both these types of Omnilinks, no changes in the code are required. You just need to add ‘http://urx.io/’ before your URI to create omnilink. 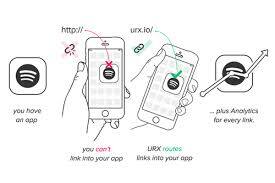 Requirement: For Omnilinks to work, an app must have deeplinks, without which the URX Omnilinks are to link between apps. Similarly, websites must have appropriate meta tags enabled to make it possible to link them to an app. URX’s Omnilinks support App Links tags, so if you App Links tags enabled, you just have to prepend the URX code to the URI. 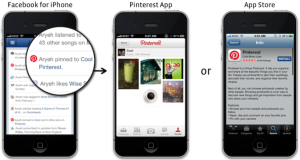 : This feature allows apps to scour the content present on other apps and also link to the respective pages of that app. Are all these different types of App Links (i.e deep links) cross-compatible? Unfortunately, only some of these compatible with each other (App Links and URX’s Omnilinks). The reason for that is, all the services are provided by different companies or organisation, and since no two services have been widely adopted by the masses yet, third-parties who can combine the features of the many services have yet to come up. Why is there a dire need for App Links? Currently, the pages or screens of apps don’t have appended URIs the way websites have URLs. So, it is impossible to locate specific pages within an app or share those pages with others. Which companies have adopted AppLinks? Facebook, a partner in the AppLinks initiative, has implemented them across most of its features. 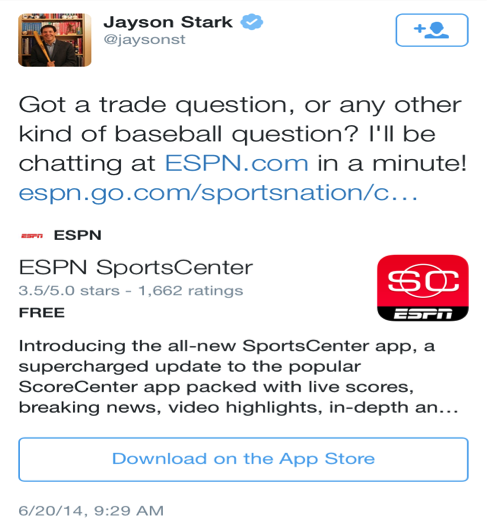 App Links currently supports News Feed, pages, status updates and links shared by apps. Top mobile apps like Mailbox, Quip, and Spotify also have deeply integrated AppLinks. Some major companies have recently made their content available for linking. They are: Pinterest, Redfin, Goodreads, Edomondo, Hulu, Flixter, Wattpad, Venmo, MovieTickets.com, Mixcloud, Rdio, SoundCloud, Tumblr, EyeEm, Houzz, Flickr, Vevo, Vimeo, Rhapsody, Fancy.com, iHeart, Songkick, and DailyMotion. Why are App Links a good investment of your time and resources? App Links are slightly complicated, and might take some time to implement and a little more to perfect, but they give you so many other things in return. First of all, they help you drive your app downloads, regardless of the platform, if visitors happen to stumble across the app download link. This will, in turn, also lead to an increase in paid app or ad revenue from your mobile app. Second of all, they convert your website visitors or users into your app users. The conversion rate is high because of the familiarity and convenience that App Links provide. This also increase the visibility of your app, which unlike your website, stays hidden from the eyes of people most of the times. Most importantly, since not many companies have implemented App Links, they will also lend your app or website a novel factor. So, people will keep coming back or download the app just to experience something new. How do I start implementing App Links from scratch? If you are implementing App Links for the first time, then use Facebook SDK to deeplink your mobile app. Facebook has provided comprehensive documentation along with how-tos (with screenshots) on how to implement App Links as well as all the special features. Also, using Facebook SDK would help you leverage your website’s social media presence to increase downloads of your app and thus generate revenue. 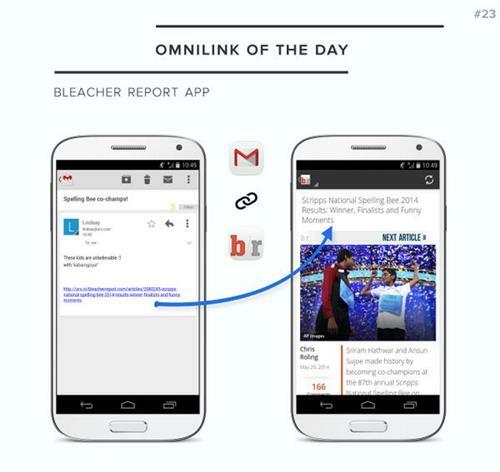 What are some new or additional features of App Links? 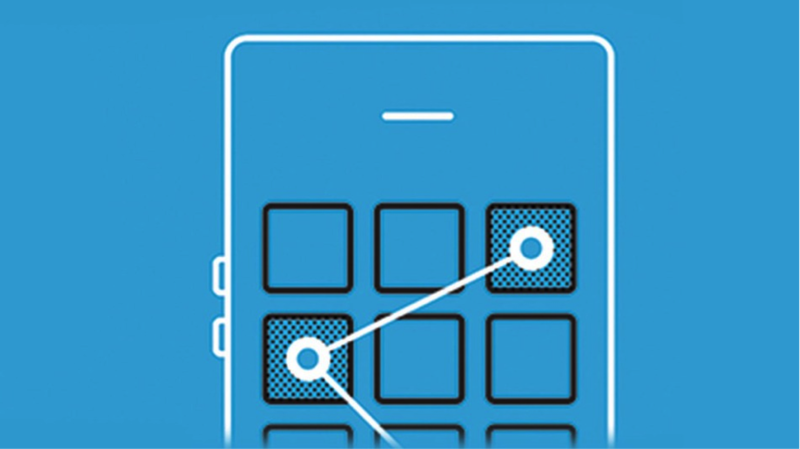 App Links have inbuilt functionality to measure and analyse how they are being used with apps. They can track the clicks, the landing pages, time, date, frequency and other data to give you a comprehensive lists and graphs of analytics. Using these analytics, you can optimize the integration of App Links into your app to enrich the experience of users or generate revenue from your app. To set up Analytics for App Links you have include lines of code on Bolts SDK, which is found in Facebook SDK. Since there is no SDK to support Bolts SDK except that of Facebook, this functionality is difficult to implement with other services. A feature similar to one designed by Tapstream for its ‘Deferred Links’, it allow users to click-through from an existing app to other apps. 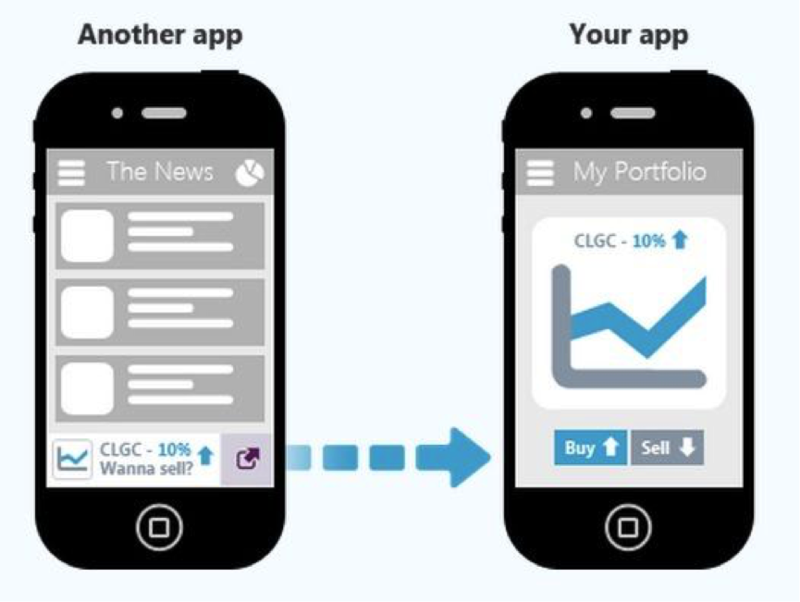 For example, if they click on an ad in one app, they will be taken to a landing page or screen on another app. The cross-platform compatibility of App Links also makes it a bit more complicated. There are three major mobile platforms (iOS, Android and Windows Phone) in the mobile app market. If you have the same app available on different platforms, you have to define platform-specific tags and make changes to code for each of your apps. The transition from a website to an app or vice versa is not smooth and seamless because of the obvious differences between websites and apps. All the pages in a website cannot be linked to screen in an app, as app use much less real and are extremely simplistic in nature. 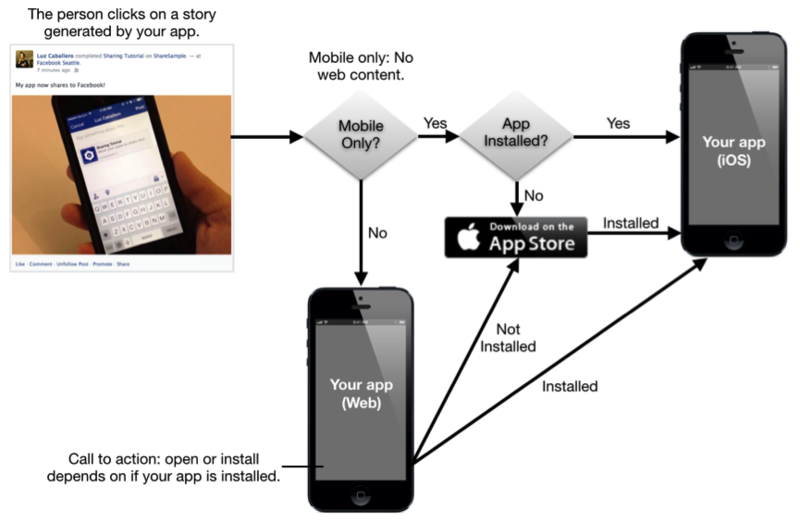 Linking to a screen from one app to a different app can also be really disruptive. For example, if I link from Facebook app to The Huffington Post and I used my Twitter account to log in to The Huffington Post, then I will be taken to the Twitter app first to login, after which I will redirected to The Huffington Post app. It is also possible that I might be directed to the download link for Twitter app even though it is already installed on my smartphone. Most of the services listed here (excluding App Links) are not available to Windows Phone apps. So, there is still no way for App Links to deeplink to your Windows Phone app. PS: I have used ‘screen’ and ‘page’ interchangeably for an app. Both mean the same, a screen or a page within an app. Also, I have used App Links instead of the oft-used generic term for mobile app links i.e ‘deeplinks’ to make understanding this new concept simpler. Previous PostPrevious How To Decide On The Most Profitable App Idea? 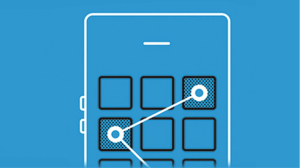 Next PostNext Why Is The Mobile App Ecosystem Fragmented?